I took my camera & ended up playing with the twins all day with my camera. If I had kids around my house all the time, I'd have 1,000 pictures a day - I'm sure. It was such a beautiful day... after we went out to eat, we came home & pulled out the Frisbee. Where did Madi's hand go? Then he went to show Sophia a magic trick. I was always afraid I'd break an ankle doing this... I probably would of too.. Even though I didnt get a picture of anyone else - trust me, we all had a great time celebrating my mom's birthday. Its the twins birthday this weekend - I should take pictures of my mom & dad all day instead.. only fair - right? I'm sure your mom is beautiful, but there is just something about kids that makes you want to click away, capturing their innocence and awe at the world. I'm sure your mom didn't mind sharing her day on your blog at all! I can't throw a Frisbee to save my life. Take pictures of your mom. Both of my parents have died, and every picture I have of them is precious. Even in the days of film, I have so many pictures of my son, but not enough of, especially, Mom. She didn't like having her photo taken, so we don't have many. I don't like having my photo taken, but someday, Mac will be glad I let people do it without a fuss. Tell your mom I said so from the bottom of my heart. They sure are quite the pair...and cute as buttons, I might add! Looks like everyone had a ball! I agree with Ellen...I'd give anything to have more pics. of my mom. Snap away! If they'd like to come over and throw a frisbee for our dog, I'd hire them in a heartbeat. I give up after about 10 tosses. These pictures are great! :-) they're so sweet! Ok, so let me start by saying that Dak is on the Ultimate Frisbee Team in college. For some reason that cracks.me.up. :). Only in college right? So tell the twins that they will be able to use the mad frisbee skills they are learning now in college :). I love you friend so much!!! Thanks for rejoicing with me for a victory in Jesus' Name. We keep fighting. to God be the Glory!! happy birthday momma!! those girls are sooo cute. That photo of Ricky is TOO funny. 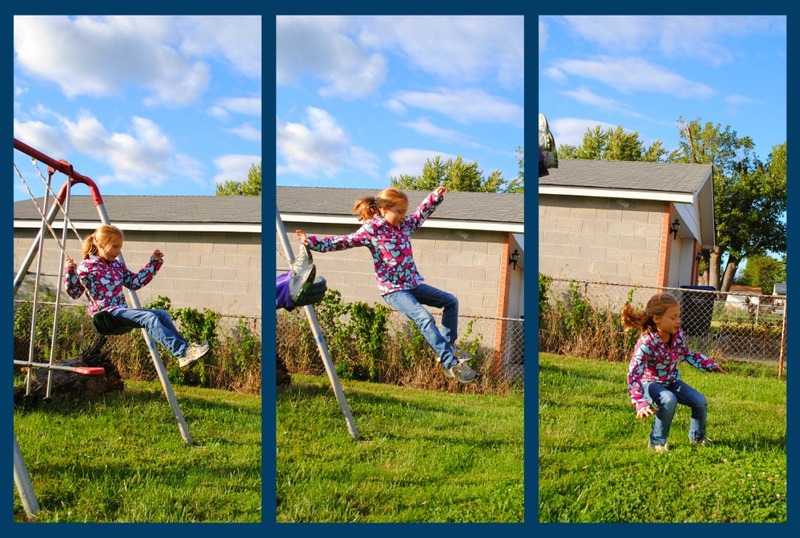 And I used to LOVE jumping out of the swings like that haha.